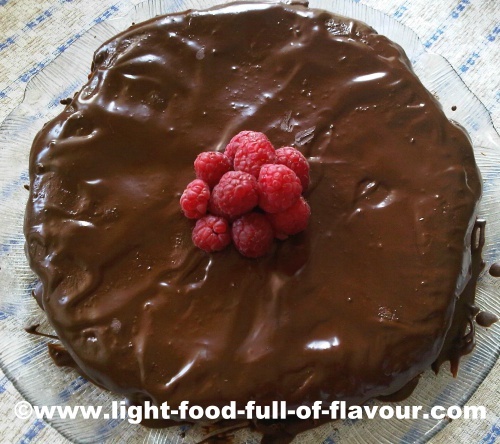 There is no doubt about it - this is a French chocolate cake recipe fit for a chocolate lover. And it is gluten-free! I have come across people who don’t like chocolate - and all the chocolate lovers I talk to don’t believe me when I tell them this – but to me it seems they are few and far between. I used to be what can only be described as a chocoholic – switching to high quality, minimum 70% dark chocolate kind of cured me. I still eat chocolate every day but usually no more than a few pieces now. This French chocolate cake is very rich and truly divine. You’ll find that most people will be perfectly satisfied with only a small piece. Though I do go the whole hog with this cake and serve it with a bit of whipped cream and either fresh raspberries or a raspberry coulis. To make the cake even more special, you can add finely grated zest from one orange. Just make sure that you scrub the orange first if it is waxed. I am using xylitol instead of sugar though. Xylitol looks and tastes like sugar but has very little effect on raising your blood sugar. I read about xylitol a while ago and finally got around to try it. And now that I have, I won’t use sugar again. Xylitol is a vegetable sugar which is similar to fructose in fruit and has a low GI. But it is still sugar! 1. Pre-heat the oven to 180C/350F/gas mark 4. Prepare a round cake tin by lining it with baking parchment, or if you have them, a round tin liner. Start by melting the chocolate. Break it up and place it in a bowl over a pot with simmering water. The bowl should not touch the water. Once the chocolate has melted, remove the bowl and put it to one side. 2. Whisk the butter and sugar until pale and light. Using a metal spoon, add the egg yolks and mix well. Add the melted chocolate and mix it in. Add the ground almonds (plus the grated zest of an orange if using) and mix well. 3. In a separate bowl, whisk the egg whites until stiff. Add half of the egg whites to the rest of ingredients and using quite big movements, carefully mix it in to loosen up the chocolate mixture but without breaking up the stiff egg whites too much. Add the rest of the egg whites and carefully fold it in as well. 4. Spoon the mixture into the prepared cake tin and place the tin in the oven. Bake in the oven 25-30 minutes. Check after 25 minutes as this cake should still be quite soft in the middle and not properly baked through like a normal cake. Take out the cake and let it cool down. 5. Once the cake has cooled down, remove from the cake tin and place it on a large plate. For the frosting, melt the chocolate and the butter in a glass bowl on top of a pot with simmering water. Remove the bowl from the heat, stir the mixture and let it cool down a little before spooning it over the cake. Use a spatula to spread the frosting over the cakes and down the sides. Cool before serving. This French chocolate cake makes a wonderful dessert. It will keep for quite a few days should you get any left-overs.